Here is your list of things to do around here this weekend! If you know of an event I should add to the list, please leave me a comment here or on the River Region Family Facebook page! Have fun exploring the Montgomery area with your family! As always, I recommend that you follow the links for more information and call ahead to confirm. Event information often changes! 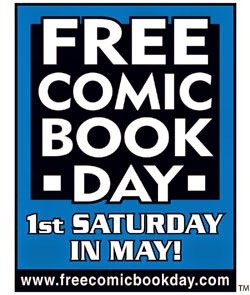 Free Comic Book Day is a single day when participating comic book specialty shops across North America and around the world give away comic books absolutely free to anyone who comes into their shops. Find a participating store here. (There are two currently listed in our area.) In our past experience there has been a table of all the available free books and you pick which ones you want. There are special editions of comics printed specifically for Free Comic Book Day. FYI: not all of the comics are what I personally consider to be kid-friendly so I always look through them first before we pick them up or before the kids look at them. Some are obviously kid-friendly, though. You can actually take a peek at the comics that will be available at this site. I know my 11 year old will really like the Transformers and TMNT ones! Pay at the gate. Admission $2 per person. $1 with Military ID. Children 5 & under get in free. Kids Area, Live Music, Arts and Crafts, Food vendors, and more! 10 am-2 pm Flimp Festival at MMFA $5 adults, $3 children Free for museum members and active duty military and their family. Make & Take a FREE & exclusive LEGO® Star Wars mini Wookiee Gunship. Meet Geoffrey! Come dressed as your favorite Star Wars character and bring your camera to capture the moment. Free docent-led tours of the museum. The event is being billed as a festival for the entire family, particularly for children, with activities for kids and refreshments. The event also will include traditional May Festival staples such as a procession of the May Queen and dancing of the Maypole.